Competing against widely used task management tools like Asana and Trello, Smartsheet has grown quickly since its 2010 relaunch. Here’s how the cloud-based app works and why it's gaining traction. Smartsheet is a cloud-based work management tool designed to be simple and easy to use by a broad range of employees. Launched in 2006, it began to gain ground after a 2010 redesign in which a significant number of features were cut. Now, more than 70,000 companies use the application, including half of the Fortune 500; customers range from Google and Netflix to the U.S. General Services Administration. Its success stems from its ability to appeal to a wider range of business users, specifically project managers, according to Chris Marsh, research director at 451 Research. For Bellevue, Wash.-based Smartsheet, this means combining a familiar spreadsheet format with richer work management and collaboration capabilities. It competes against more widely used task management products like Asana and Trello. “It has gained viral appeal among business leaders and their teams as a tool flexible enough to address lots of different work use cases…that didn’t need involvement from project management specialists or business analysts,” Marsh said. Although it has similarities to more traditional project management apps, Smartsheet is part of a new generation of emerging work management tools that includes the likes Clarizen, Workfront, Asana, Planview’s Projectplace, Wrike and others. “As rich as the potential is from these vendors, there isn’t an easy way to describe this category: more agile than project and portfolio management tools, more comprehensive than team and task management, collaborative in nature but not collaboration tools,” said Marsh. At its heart is a simple user interface that focuses on ‘sheets’ similar to Excel spreadsheets, which have long been used to manage projects but can become unwieldy and complex to use. 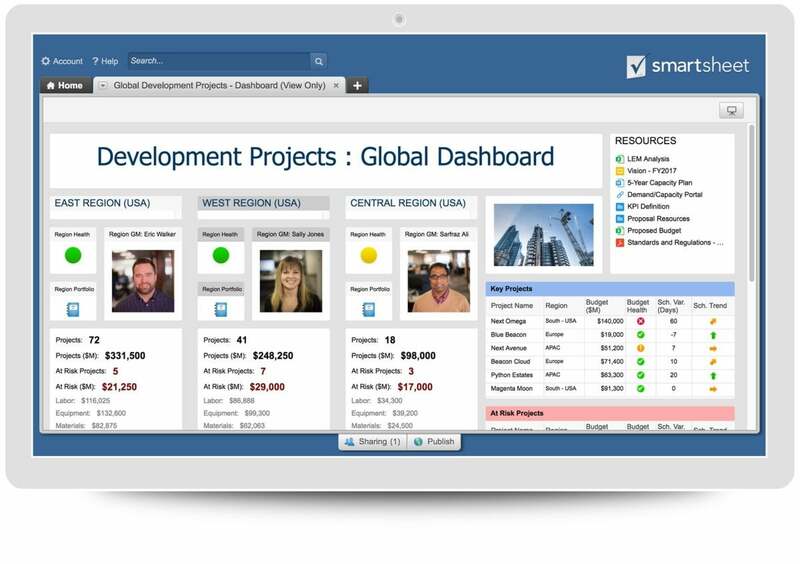 There are a number of ways to track the progress and status of projects within Smartsheet. The company last year added Kanban boards similar to those seen in Trello with the launch of Card View; users can also manage tasks from the app’s calendar feature. There are also capabilities designed to track work at a high level. In 2016, for example, Smartsheet launched a visualization dashboard, Sights, to offer businesses a window into the work being done across teams such as important projects, deadlines and goals. One goal: to offer greater visibility into bottlenecks on complex projects. 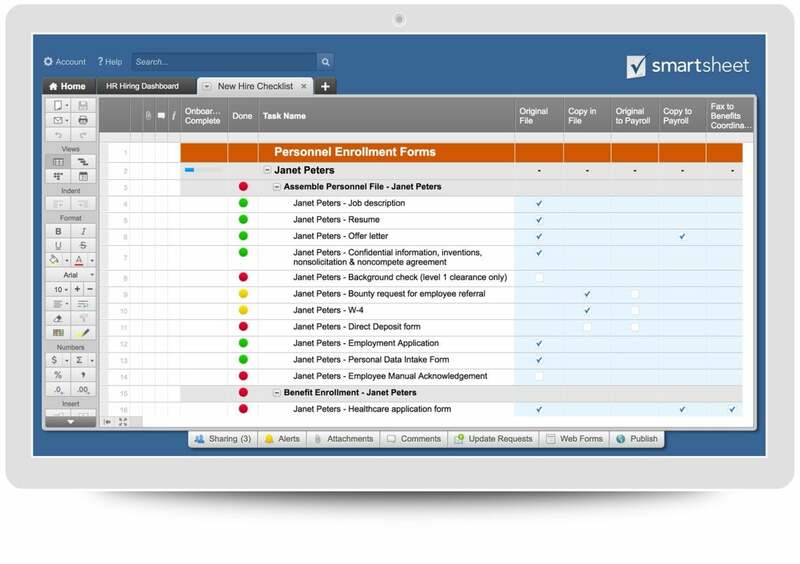 A hiring checklist shown in Smartsheet. Collaboration is key to Smartsheet. Each of the sheets and rows can be shared with colleagues via email, providing them access to all notes, comments, files and other information that’s relevant to a project or task. Documents such as PDFs, presentations and graphic files can be stored and attached using Google Drive, OneDrive, Box and DropBox accounts. Smartsheet does not envision that it will be the only collaboration tool used by a company. It offers a range of integrations with others tools, including Microsoft’s Teams messaging platform, Office 365, G Suite, Atlassian Jira, ServiceNow and Salesforce. Surprisingly, however, there is currently no integration with Slack. Although Smartsheet is free for those who want to only view or edit information, it is offered in four paid tiers. Individual subscribers pay $14 a month (when billed annually), with access to email support, 10 sheets, the mobile app, some third-party integrations and limited collaboration features such as the reminders and notifications. Team subscriptions cost $15 per user per month on an annual basis for a minimum of three users. This level adds more sheets, unlimited reports and includes phone support and some admin controls. The business tier, at $25 per user per month, increases the number of accessible sheets to 100 per user, and provides additional collaboration features such as automated actions and a wider variety of integration options. Enterprise users, who can negotiate a custom pricing plan, gain access to the full range of admin controls – such as single sign-on and enterprise access control – collaboration features and others. The company has full pricing details available online. Smartsheet has been spending money to expand its business, with new offices that opened in Boston in January to target clients on the East Coast and in Europe. The company plans to add 300 new employees to its ranks, which numbered 460 employees at the start of 2017. That heacount includes sales and customer support staff. One significant hire is Gene Farrell, the former Amazon vice president for enterprise applications and EC2 Windows team; Farrell worked on Amazon Web Services’ growing list of productivity software tools such as WorkDocs, WorkMail and Chime. Amazon had attempted to block the move on the grounds that Smartsheet competes with some of AWS’ own software, hinting that a similar product could be in the pipeline. But Amazon dropped the effort in June, having reached an agreement around temporary restrictions on Farrell’s input at Smartsheet. At its first-ever major customer conference in September, Engage, the company added new automation features involving approval and update requests. Smartsheet CEO Mark Vader said that was just the first step in the company’s plans to eliminate unnecessary manual processes. The company has set Oct. 1-4, 2018 for its next Engage conference. The challenge ahead for Smartsheet is to convince more large enterprise companies to deploy the tool. Smartsheet drew in more than $70 million in subscription revenues in 2016 and claims “rapid growth” in its enterprise segment. The number of customers who pay more than $100,000 per year for the application saw triple-digit increases year-over-year in 2016, though specific numbers were not available. However, the company still has a ways to go in convincing large businesses that it is enterprise-ready. “It’s not yet considered an enterprise solution, despite the fact it is used enterprise wide, and [has] a clear message about enterprise data analysis,” said Visitation at Forrester. 451 senior analyst Raul Castañón-Martínez said that while Smartsheet appeals to end users, it can be difficult to communicate those benefits to C-level execs who hold the purse strings at large organizations. There may be hundreds of staffers using the tool internally before a CIO has even heard of it. “The product is at a stage where it has to develop a sales narrative for enterprise IT decision makers i.e. ROI, value proposition,” he said.